NOTE: This app has been coded and tested, but has not yet been completely "designed" to make it as interesting and esthetically pleasing as it should be. This is a simple, "boiler-plate" version. This "universal" version is for iPad AND iPhone. Test your skill! Test your nerve! This game flashes an image on the screen, and you must touch it within a certain amount of time, or you get an "X"! Three "X's" and you are OUT! There are also bombs that pop up! 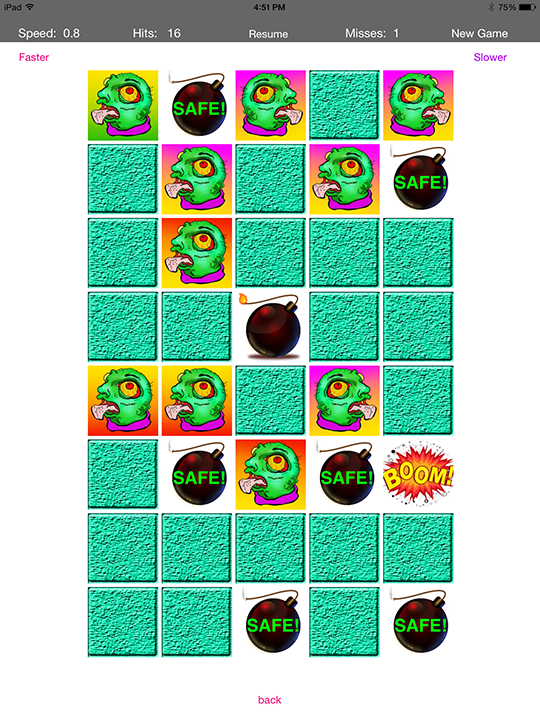 You must touch each bomb in time, just like the other images, or BOOM! It's over for you on this go-round! You can speed the game up, slow it down, or pause it. Do really well and you get your name on the TOP TEN List! 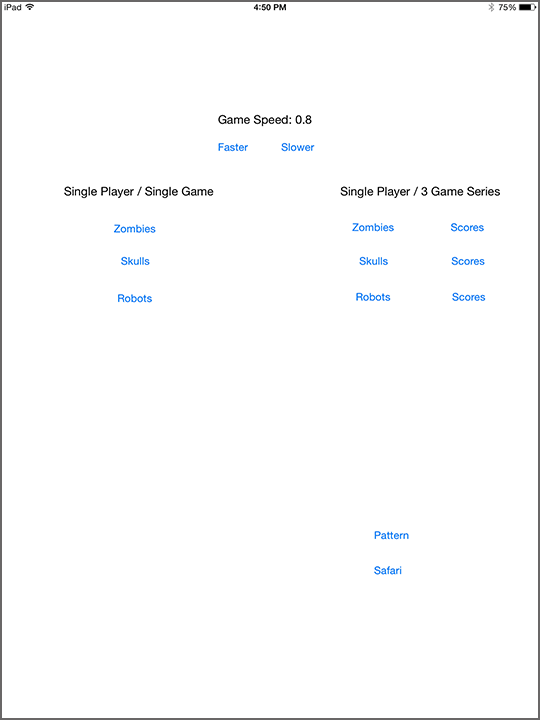 Choose Zombies, Skulls, or Robots for opponents. (Complete artwork still under development at this time). Plenty of Zombies to tap, and plenty of bombs! This player better tap that bomb before it blows, like one below it has already! Speed up your game, or slow it down. Pause it, or start over. Keeps tracks of your "Hits" and "Misses" as well! Uh oh! This player missed three bombs! BOOM! 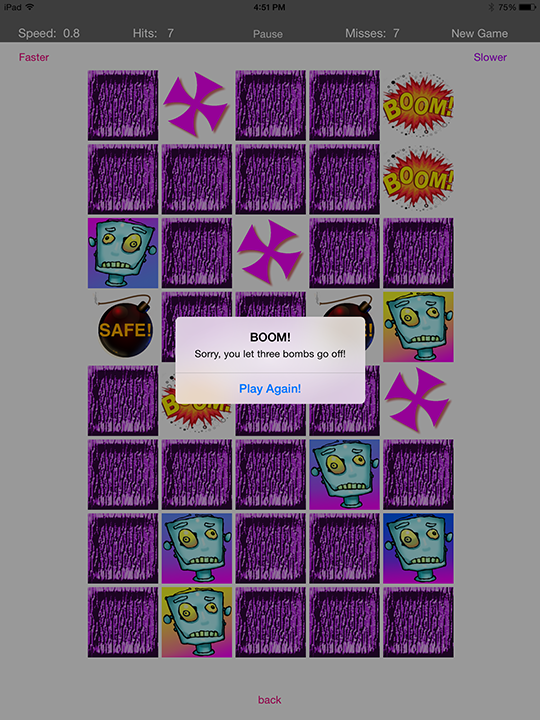 Game over for now, but you can try again, and maybe slow it down a little bit to improve your skills! The Robots still out-number the bombs at this point. Congratulations! You did so well against the Robots, your score has been added to the "Top Ten List!" 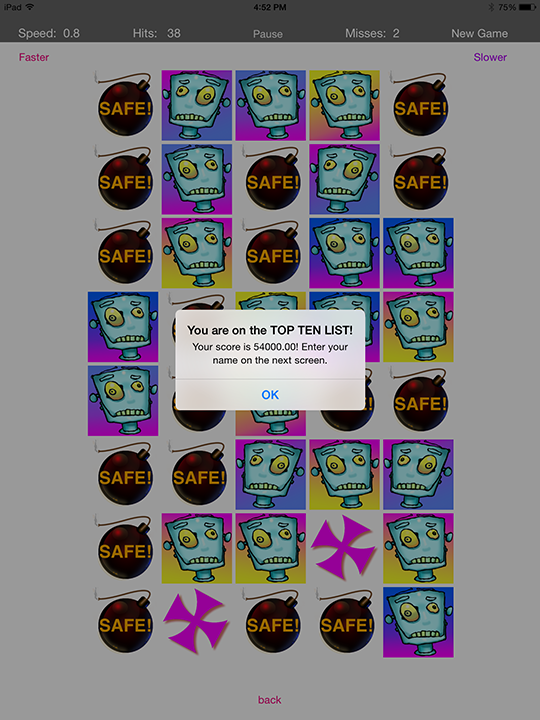 This player's score of 54,000.00 points has been added to the Robot's "Top Ten List." 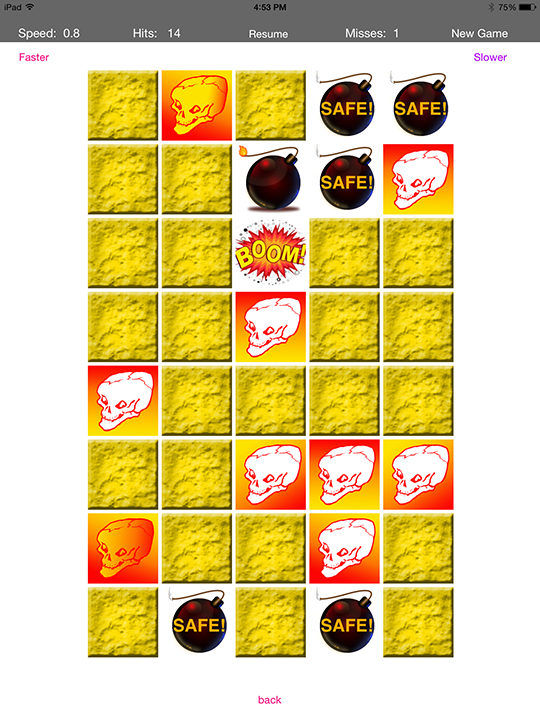 This game of Skulls is going well, but the player better tap that "unsafe" Bomb image before it blows! Remember, you can make the game speed up or slow down using the "Faster" and "Slower" buttons on the top left and right corners. The speed is shown in the upper left corner. A complete "Top Ten List" for the Zombies game.